For professional landscapers compromising on quality is not an option, therefore The Grass People offer premium quality seed mixtures for domestic and amenity areas. Whether your landscaper project is to create a multi-purpose sports area or a luxurious, bowling green style lawn we have expertly selected varieties to create mixtures to serve all landscaper purposes. All our landscaper grass seed is available in 10kg bags which cover up to 285 metres squared and 20kg bags which cover over 570 metres squared based on a seeding rate of 35grams per metre squared. This can be adjusted dependant on if you are overseeding or reseeding. All Rounder Grass Seed is a great multi-purpose seed mixture suitable for anything from back gardens to country parks. Technical information: Perennial Ryegrass - 50%, Chewings Fescue - 15% and Strong Creeping Red Fescue - 35%. 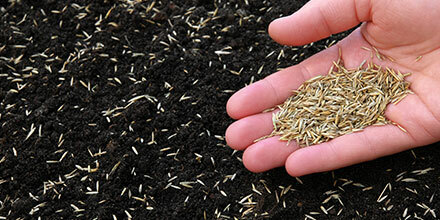 If you are tasked with creating a golf course or bowling green lawn look, Fine Finish Grass Seed is the perfect choice. Technical information: Strong Creeping Red Fescue - 70%, Chewings Fescue - 20% and Slender Creeping Red Fescue - 10%. Hard Edge is particularly useful for those working to tender specifications for use on highway verges, embankments and roundabouts. Technical information: Strong Creeping Red Fescue - 30%, Perennial Ryegrass - 40%, Slender Creeping Red Fescue - 10%, Smooth Stalked Meadow Grass - 10%, Highland Browntop Bentgrass - 7.5% and White Clover - 2.5%. Low Upkeep Grass Seed is a blend of slow-growing fescues designed for areas where low maintenance is required such as caravan parks and holiday homes. Technical information: Strong Creeping Red Fescue - 50%, Chewings Fescue - 30% and Sheep Fescue - 20%. Self Repairing Lawn Seed creates a self-repairing grass lawn - the perfect choice for large areas which receive high levels of traffic such as parks and other public areas. Perfect for landscaping projects with an economical approach. It is a good multipurpose mixture which grows quickly and provides an attractive green. For specialised grass seed mixtures for shaded areas click here.